There are many different types of jobs in the dental industry in Canada. Specifically looking at dentist’s themselves we find many different career paths. From an associate dentist, periodontist or endodontist. The one path we will discuss today and talk in length is the job of an oral and maxillofacial surgeon. 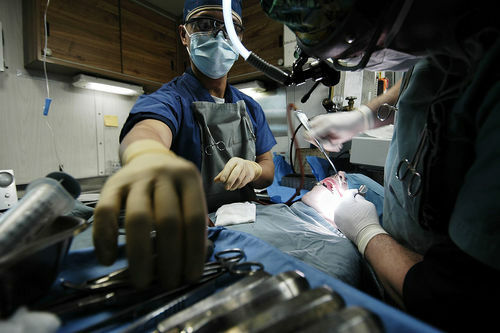 Oral and Maxillofacial Surgeons (OMFS) are uniquely trained to manage the diagnosis, surgical and medical treatment of diseases, as well as traumatic injuries and deformities of the mouth and facial region. OMFS are trained to correct the results of birth defects and accidents, tumors, missing and impacted teeth and malfunction of the jaw joints. To make procedures more comfortable for patients, various methods of sedation are available to patients, including local anesthesia, intravenous conscious sedation, and general anesthesia. Getting hired begins with the candidates will to begin a job search. This could be done by looking for jobs online, word of mouth, dropping resume's off at nearby practices. Perhaps you seek an Associate job,, Hygienist job or even a Dental Assistant job and you’ve been invited for a one-on-one after submitting your application online. You are thrilled and at the same time a bit of apprehension is creeping up your spine. This could be it --- an excellent start to your career. What do you do? How do you go about preparing to crush this interview after an exhausting online job search? So many questions are jostling around in your mind. Are you now becoming frantic? Fear not. Some may be aspiring to secure a dental assistant job position but are always wondering if it would be worthwhile. Even though dental assistant jobs aren’t the same as a dentists job, they sure have roles that are instrumental to a successful dental practice. This piece will be shedding light on the unique versatilities of dental assistants to the smooth running of any dental practice. It’s also vital to point out that dental assistants contribution in dentistry helps in boosting the delivery of dentists services which leads to optimal patients satisfaction. However, this write-up will be shedding light on information revolving around dental assistants including their distinct roles. First off, what does a dental assistant do?